The advances in technology and changing demand from students and businesses, as well as the possibility for reducing costs and generating income, has led to the explosion in Massive Open Online Courses (MOOCs). Over the last years MOOCs have received a great deal of attention from the academic community, the business community and the media. The boost of MOOC initiatives in Europe is connected with several crucial issues – the issue of awarding credits, infrastructure and the business model, and last but not least the issue of appropriate adaptation to the local cultural context, specific educational needs, gaps and necessities. This paper aims to identify the European regions and players lagging behind in MOOC initiatives. The MOOC paradigm contributes to companies, HEIs, governments and entrepreneurs in changing the face of teaching and learning, the structures set up to provide these services, and the vision for lifelong learning. 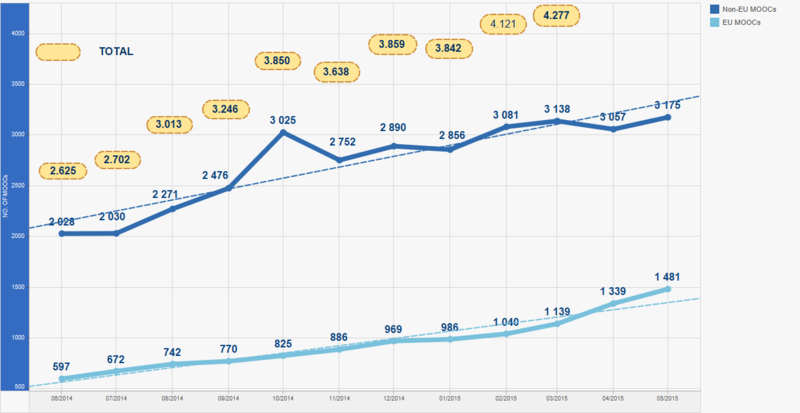 The number of the Massive Open Online Courses (MOOCs) is increasing exponentially across the globe. Harvard University and the Massachusetts Institute of Technology, which jointly founded the leading MOOC provider edX, conducted a study called HarvardX and MITx: Two Years of Open Online Courses Fall 2012-Summer 2014 (Ho et. al 2014). The study covers 68 courses with 1.7 million participants and 10 million participant hours and for the moment is one of the largest studies done on MOOCs. The survey report showed that the development of MOOCs had significant impact on regular courses in Harvard and MIT. In fact, 83 per cent of the regular students at MIT had used the MOOC platform for a substantial part of their coursework in at least one course unit. This fact shows that a proper integration of MOOCs in higher education could contribute to a more effective use of teaching time and a flexible learning offer to traditional students and lifelong learners. The appearance of disruptive innovation like MOOCs has the potential to transform higher education and create new competition and centres of excellence among universities worldwide (European Commission, Directorate-General for Education and Culture 2014: p.12). Concerning the European MOOC perspective, even though the MOOCs initiatives exist in Europe, the biggest shifts are taking place in other regions of the world, particularly in the USA and some Asia countries. For example, the three main MOOC providers in the USA offer hundreds of courses, with several million users worldwide, whereas the European universities providing MOOCs are far from these levels of achievements. Available details concerning the current state of the European MOOCs initiatives are provided by the European MOOCs scoreboard, integrated in the Open Education Europa portal. The aim of the Open Education Scoreboard is to highlight the huge potential that European institutions have in the world of MOOCs and to help visualize this potential by compiling the existing European-provided MOOCs available on different open websites. Before commenting on the available data sets, it is important to clarify when a given MOOC is considered as a European MOOC. “European MOOCs” are considered to be those MOOCs provided by any European institution, regardless of the platform that hosts them. All of the MOOCs accounted for in the Scoreboard are registered in the MOOC aggregator on the OEE website (i.e. MOOCs which are not registered are not taken into account even if provided by European institutions). Another crucial point to note is that the scoreboard data is cumulative (i.e. the MOOCs, which are already over, are not deleted). Additionally, if a course is offered more than once, we would add any subsequent session as a new entry. Taking the above into account, it could be concluded that there are some important aspects for improvement, but for the moment this is the most comprehensive source of information about the European MOOC initiatives. The figure below (Fig. 1), representing the data provided by the European MOOCs scoreboard about EU and Non-EU initiatives up to the middle of 2015, shows that MOOCs are still of high and seemingly growing interest at European universities. Nevertheless European initiatives in the MOOCs development are lagging behind Non-EU achievements in this domain. The efforts of the European Higher Educational Institutions regarding the development of massive open online courses has started multiplying rapidly in recent years, with a steady average growth. The table presented in Figure 2 presents the most recent available data about the distribution of European MOOCs by countries and by subject domains. Based on this data, Western European countries are the most active in offering MOOCs at the European level. Indeed, Spain, United Kingdom, France, Germany, and Switzerland, all appear in the top 5 of the European MOOC providers. However, despite the fact that Nordic countries (Denmark, Finland, Norway and Sweden) are leaders in terms of competitiveness according to academic and innovation performance (World Economic Forum, 2016), they are far behind other European countries when it comes to MOOCs. Whereas in the case of Spain, not a leading country in terms of innovation, the offer of MOOCs is the highest in Europe. The available data clearly illustrates the lack of participation from the Eastern European countries lagging behind the European initiatives in MOOC development, Bulgaria, Poland or Cyprus showing a rather shy involvement in this kind of activities with only one MOOC offered. 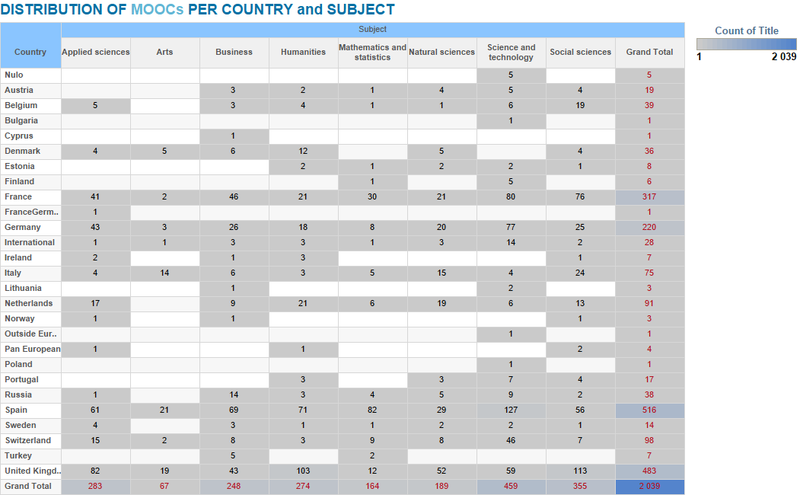 The subject domains best covered by European MOOCs could be ranked as follows: Science and technology, Social Sciences, Applied Sciences, Humanities and Business. Despite being in the top 5, more efforts in the Business sector should be carried out considering the current trends to increase Entrepreneurship education as a solution to the current economic crisis. Despite the undisputable benefits of MOOCs being quite obvious ever since their first appearance in 2008, as well as the exponentially raised number of the unique registered learners (Dhawal, 2014), they have nevertheless also received extensive critiques. Course providers have made clear from the beginning that they would not award credits for MOOCs. This is in a contradiction with the spirit of recognition of learning, regardless of where and how it takes place. According Daniel (2012) the fundamental contradiction in this context is that for most xMOOC institutions success in the course exam does not lead to credit, but to a certificate. The consequence, as Touve (2012) underlines, is that what decides whether or not a student can obtain a degree is determined not by their mastery of the courses, but by the admissions process to the university. Among the members of the European University Association there is general consensus that MOOCs should be closely monitored, but also that beyond the present excitement, it would be important to analyse innovative learning provision trends, and also consider implications for institutional recognition practice and definition of degrees (Gaebel et. al., 2014). Learning outcomes, credit systems, qualification frameworks, flexible curricula and recognition of prior learning are examples of approaches and instruments that form the conceptual and operational basis of a higher education (HE) paradigm shift towards student-centred learning (SCL), which is characterised by innovative methods and interaction between teachers and students to support the achievement of intended learning outcomes, where the students are viewed as co-responsive and active participants in their own learning process. The publication of the European Students’ Union (ESU) – “Policy paper on quality of higher education (amended)” emphasizes that such “a paradigm shift cannot be achieved only by structural measures, but requires adequate funding, constant promotion within and acceptance by the whole academic community, including students” (ESU, 2014: p. 3). If we consider MOOCs as a form of open education (based on the SCL approach), offered free through online platforms and taking into account the initial philosophy of MOOCs to open up quality higher education to a wider audience, it is then very important to see how this paradigm is integrated in the HE systems in Europe and the current state regarding the recognition of the knowledge and skills gained through MOOCs. The establishment of systems for the recognition of all forms of prior learning has become one of the central themes not only in the higher education sector, but also in all other sectors of education and training. Along with the recognition of prior formal learning, which commonly takes place in all countries, particular emphasis is being put on the need to enhance the recognition of the knowledge and skills gained through non-formal and informal learning (European Commission/EACEA/Eurydice, 2015). From the learner’s perspective, the recognition of prior learning is most commonly undertaken with one of the following objectives: to gain admission to a higher education programme or to progress in higher education studies. Moreover, from the students’ perspective it is very important to be ensured the possibility “to have their prior learning recognised, independently of how it was achieved (either through formal, non-formal education or informal learning), even if they do not hold a formally certified qualification providing access to a certain education programme” (ESU, 2014: p. 2). As far as alternative access to higher education is concerned, the overall picture across the European Higher Education Area /EHEA/ shows that in 22 higher education systems (most of them in Western Europe) at least one such alternative route to higher education exists, while in the remaining 25 systems for which data is available the access to higher education still depends on the possession of an upper secondary school leaving certificate (general or vocational). The access of non-traditional students to higher education is identified as one of the strategic priorities of the EC. Under the funding agreements for the period 2012-2015 additional funding was provided to Higher Educational Institutions to facilitate the access of students older than 25 years (European Commission/EACEA/Eurydice, 2015, p. 121). In more than half of the systems (28), it is still not possible for candidates to be admitted to higher education on the basis of the recognition of prior non-formal and informal learning. In those countries, all higher education candidates must hold a higher education entry qualification (or pass an entry exam). In 9 systems, at least some (types of) higher education institutions (e.g. universities of applied sciences) or programs are already open to admission based on the recognition of prior non-formal and informal learning. In 11 systems, admitting candidates without standard qualifications based on the recognition of prior learning is possible in all higher education institutions/ programs. The possibility to take prior learning into account towards fulfilment of a higher education study programme is more widely implemented than admission based on the recognition of prior non-formal and informal learning. This possibility exists in 29 systems (18 of which also offer admission based on the recognition of prior learning). In about half of the 29 systems, it is a legal right for candidates to have their prior non-formal and informal learning recognised towards fulfilment of a higher education study programme and higher education institutions must provide relevant procedures. In the other half, the higher education institutions can autonomously decide whether they will provide relevant procedures or not. In a number of systems, higher education candidates or students who would like to fulfil their higher education modules/ program through the recognition of non-formal and informal learning need to meet special requirements, mainly related to the duration of prior professional experience, for example 2 years in Denmark (only for some programs), 3 years in France, Luxembourg and Malta, and 5 years in Belgium (French Community). In some countries like Portugal and the United Kingdom (Scotland), it is up to higher education institutions to define the requirements that need to be met. In the report of EUA about the results of the mapping survey1 conducted in 2014 more than 240 higher education institutions from 38 European systems (EU and wider Europe) were asked whether they would award credits for their own MOOCs. 12 of the 31 institutions said they award credits to all students (2 institutions), only to their own students (4 institutions), on a case-by case basis (1) or by means of a competence-based assessment (5). Of the 19 other institutions that do not award credits, 13 award completion certificates (although one notes that the certificate is awarded by Coursera). One institution also has plans to award credits (Gaebel et al., 2014: p. 68). According the survey of Bologna Follow-up Group cited in the 2015 annual report of Eurydice titled ‘The European Higher Education Area in 2015: Bologna Process Implementation Report’ (European Commission/EACEA/Eurydice, 2015: p.125) in the majority of cases (20), recognition of non-formal and informal learning can only lead to a limited number of credits. In 19 systems, mainly in the South-East, prior non-formal and informal learning cannot be taken into account/ accredited towards fulfilment of a higher education study program. In two of the 19 countries (Austria and Iceland), some higher education institutions or programs are open to admission on the basis of recognition of prior learning. In the remaining 17 systems, recognition of prior non-formal (MOOC learning including) and informal learning is not used at all, neither for admission to nor for progression in higher education. This result outlines the validation of MOOC learning as a very important issue. Concerning the recognition of MOOCs, the existence of accessible, clear and transparent procedures for credit assignment that are correlated to the achievement of learning outcomes is of great importance. The credit assignment to MOOCs will facilitate access to higher education for non-traditional learners by providing entries to certain educational programs, as well as gaining the recognition of certain parts of some educational programs (e.g. courses, modules) due to already achieved learning outcomes. Therefore, the existence of a policy establishing guidelines for assigning the number of credits to MOOCs can facilitate automatic recognition procedures and can also open “the possibility for flexible learning paths and equal opportunities for high-quality education, increasing the mobility of students and graduates in the EHEA, as well as enhancing graduates’ employment chances” (ESU, 2014: pp. 10-11). According to the 2015 Annual report issued by Visiongain (MOOC Market 2015-2020) the MOOC market is exhibiting great potential to grow exponentially over the next few years. MOOCs appear as a very advantageous and commercially interesting solution for many companies looking to implement effective training programs for employees, as a result they have the potential to revolutionize the corporate learning industry. The growing number of connected devices, high enrolment rates in MOOCs, the increasing acceptance of MOOC-based training in enterprises around the globe and the increasing demand for low cost, high quality and globalised education could be considered as main reasons for the substantial uptake of the technology. In this context, the assurance of an appropriate MOOC infrastructure, efficient business model and validation process are among the aspects which mirror the capacity of the enterprises to leverage ICT to increase their competitiveness. The World Economic Forum measures the capacity of countries to leverage ICTs for increased competitiveness and well-being trough the complex indicator Networked Readiness Index (NRI). 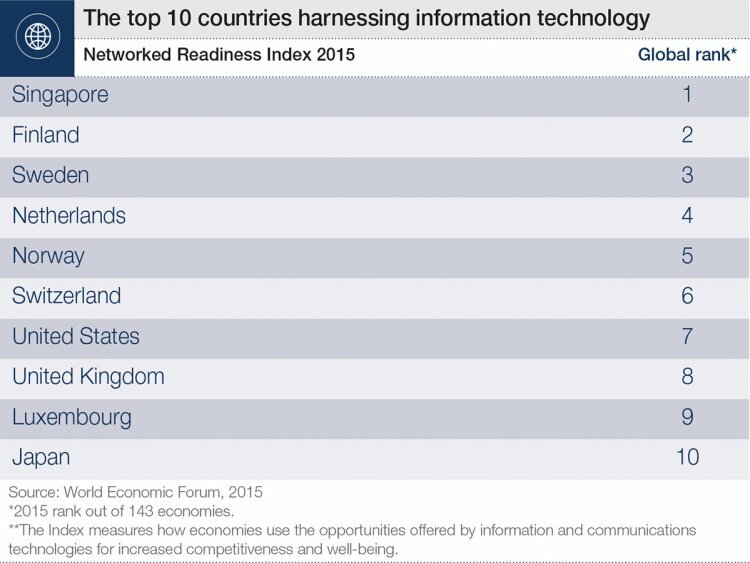 The annual report of the World Economic Forum ‘Networked Readiness Index 2015: Taking the Pulse of the ICT Revolution’ (NRI 2015) presents the ranking results of 143 countries. Impact subindex: Economic impacts (4 indicators), Social impacts (4 indicators). Embracing collaboration, which must take advantage of networked collaboration tools and social networking in order to develop mechanisms that bring educators of teachers together to pool expertise and share content. aking into account the challenges mentioned above, in this context it is also important to discuss the question put by the United Nation – “whether MOOCs, with their focus on offering tertiary-level courses for mass consumption, are a panacea for increasing access to tertiary education in the developing world, or whether they will instead widen the gap between those with access to higher education and those without” (Bhandari 2014). The success of the MOOCs is based on the fundamental assumption that the lifeline of technology is readily available. Currently many developing countries face severe infrastructure issues connected with the supply of electricity and / or the requisite bandwidth. In Europe the situation is better but in some of the Eastern European countries (especially their rural regions) some of these infrastructure problems still exist, though not with the same sharpness as in developing countries. In the NRI annual report Michael Kende from the Internet Society emphasizes that the activity of innovation becomes more inclusive because more people—across countries and income levels, education and gender—are able to create new enterprises. For this reason the results of innovation becoming more inclusive, as many new entrepreneurs focus their efforts on filling market gaps close to home. Kende argues that policymakers can focus on ensuring the appropriate infrastructure in order to foster this new source of startups. Figure 3 represents the ranking results for the top 10 (out of 143 ranked) countries harnessing information technology. The ranking of the top 10 European countries harnessing information technology is depicted below. Nordic European countries are very well ranked as three of them are in the global top 10, with Finland and Sweden in the 2nd and 3rd positions respectively, and Norway in the 5th. Additionally Denmark and Iceland are in the top 20, ranked 15th and 19th respectively. Finland, Sweden and Norway have maintained this leading position (already in the top 10 in 2012), whereas Denmark has fallen from the top 5 (ranked 4th in 2012) to the top 20 due to a worsening of the political and regulatory environment. Iceland remains fairly stable (15th in 2012). The group performance of Western European countries in the global ranking is strong. The Netherlands (4th), Switzerland (6th), the United Kingdom (8th), and Luxembourg (9th) all appear in the top 10. Germany, on one hand, despite of the economic crisis, managed to climb from the 20th position to 13th in the last years due to its business and innovation environment improvement. On the other hand, in the same period as Germany progress in the ranking, France lost three positions and closing the group in the sub-region in a 26th position. In Southern Europe, countries like Portugal (28th), Italy (55th) and Greece (66th) have improved significantly from last year on the back of major improvements in government usage, whereas Malta (29th), Spain (34th), and Cyprus (36th) remain quite stable. These largely positive trends contribute to narrowing Southern Europe’s gap with the rest of the region, which had been widening since 2012. Thanks to the strong performance of Estonia (22nd) and the steady rise of Latvia (33rd), which is catching up to Lithuania (31st), the Baltic countries are slowly but surely bridging the gap with the Nordics – a remarkable achievement for the three former Soviet Republics. The Eastern European countries that have joined the European Union (EU) stepwise in 2004 and 2007 have generally experienced a dropdown trend. This would be the case mainly of Slovenia (37th, down one), the Czech Republic (43rd, down one), Hungary (53rd, down six), Croatia (54th, down eight). While the Slovak Republic (59th) is showing a stable ground, Poland has entered the top 50 after raising 4 places. However, Romania seems to be the country with the most relevant improvement of 12 positions until reaching the 63rd place, ahead of Bulgaria (73rd). As a conclusion, the performance of countries largely mirrors their position on the development ladder: a higher level of income is typically associated with a higher NRI score. The World Economic Forum defines competitiveness ‘as the set of institutions, policies, and factors that determine the level of productivity of a country’ (http://reports.weforum.org/global-competitiveness-report-2014-2015/methodology). The Global Competitiveness Report (GCIR is a yearly report published by the World Economic Forum. In this Report about 140 countries are ranked on the base of the Global Competitiveness Index (GCI). The GCI integrates the macroeconomic and the micro-business aspects of competitiveness into a single index, which is made up of over 110 variables, structured in a framework and a corresponding set of indicators in three principal domains (pillars) and twelve sub-domains. According to the GCR authors, competitiveness, considered as a higher productivity, is a key driver of growth and resilience. ‘The level of productivity, in turn, sets the level of prosperity that can be reached by an economy. The productivity level also determines the rates of return obtained by investments in an economy, which in turn are the fundamental drivers of its growth rates. In other words, a more competitive economy is one that is likely to grow faster over time’ (GCR – Methodology 2015). Many determinants drive productivity and competitiveness. Among the classical and neoclassical ones, more recently the focus has also been extended to other mechanisms such as education and training, technological progress, macroeconomic stability, good governance, firm sophistication and market efficiency, among others. Through a systematic assessment of the drivers of productivity, the Report identifies priority areas for structural reforms and plays a role of guide and monitoring tool for all stakeholders to steer their actions towards enhanced competitiveness. It is not possible to maintain high levels of competitiveness without well-functioning public and private institutions, appropriate infrastructure, stable macroeconomic framework as well as good health and education, which is ultimately reflected in the latest ranking results. 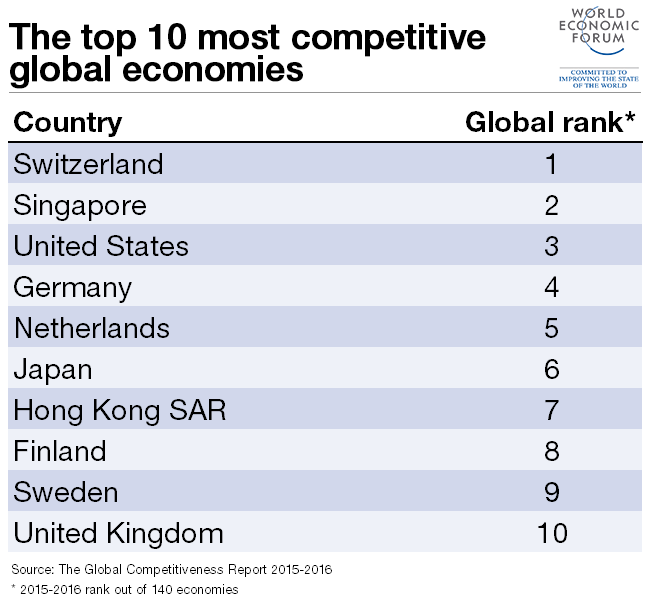 Figure 5 below shows the top ten most competitive economies in the world. More than 50 per cent of them are European countries – Nordic countries and countries from Western Europe. The overview of the GCI shows that the most advanced European economies have recovered to their pre-crisis level of competitiveness. As in previous years, they fill all the top positions in the rankings. Yet some disparity remains, with some Southern European countries occupying the lowest rankings in this group. At this point, it is worth mentioning the case of Greece, which, under the current situation of economic crisis, situated at 81st place. There is no doubt that this is due to the financial crisis that initiated the worst world economic crisis provoking huge instability at macroeconomic level with tremendous unemployment rates, unseen country risk and general lack of confidence in advanced economies. The situation of the macroeconomic environment of Greece in 2015 is comparable to the one of Ghana, Gambia or Egypt under the GCI system. The long period of economic instability (almost a decade) and a double-dip recession have eroded trust in public institutions in most advanced economies, especially in Southern Europe. At the same time, the quality of infrastructure there has been improved thanks to heavy investments and increased market competition. The businesses from this part of the Eurozone show signs of convergence with their northern counterparts. The results from GCR demonstrate a divide in Europe between reformist countries and the other countries. In France, Ireland, Italy, Portugal, and Spain, significant improvement has been observed in the areas of market competition and labour market efficiency thanks to the reforms these countries have been implementing. By contrast, Cyprus and Greece have failed to improve in these pillars (GCI 2015). It is undisputable that technology is increasingly essential for businesses’ competitiveness and prosperity. The technological adoption category assesses the agility with which an economy adopts existing technologies. Technology is understood as a concept covering not only products but also processes and organization methods, all linked by the common factor of enhancing efficiency in production. In addition, technology adoption contributes to an innovation ecosystem. There are two sources of technology adoption: local companies can invest to bring in technology from abroad or from other sectors or companies, and a country can exploit spillovers from the direct foreign investment of international companies. Consequently, the wider the gap between foreign technology and the technology available in the country – and the longer the gap between invention and its adoption – the more difficult it is for new technologies to be imported. In this context educational technologies are not an exception. The EU spends about 6% of its GDP (2011) on education, almost all financed by the public sector. Current expenditure accounts for 90% of this, mostly for teaching and the operation of facilities. Approximately 9% is invested in facilities such as equipment and school buildings. By comparison, US education spending is 7.3% of GDP with a 30% private sector contribution, in particular for higher education, which is used especially for provision of incentives for greater business orientation of higher education and research. Expenditure per pupil in the US is 30% and 40% higher for pre-primary and school education (primary and secondary) and double for tertiary education (EIB, 2015: p. 30). Finally, indicators assessed by the World Economic Forum suggest that the EU performs worse than the US, Japan or South Korea across a range of innovation environment dimensions. The largest gaps with respect to the US are in company spending on research and development and university-industry collaboration. (European Investment Bank, 2016). 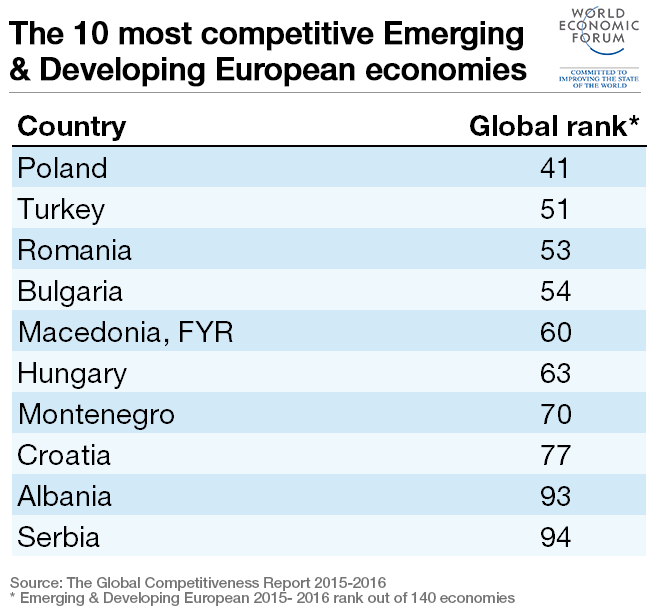 The ten most competitive Emerging and Developing European countries are presented in the Figure 6 below. The European Innovation Scoreboards (EIS, 2015) provide a comparative assessment of research and innovation performance in Europe. Assessment of the research and innovation performance of the EU Member States and the relative strengths and weaknesses of their research and innovation systems helps Member States assess areas in which they need to concentrate their efforts in order to boost their innovation performance. The measurement framework distinguishes between 3 main types of indicators (Enables, Business activities, Outcomes) and 8 innovation dimensions, capturing in total 25 different indicators. Enables – put the focus on innovation dimensions: Human resources; Open, excellent and attractive research systems; Finance and support. Business activities – capture the innovation efforts at the company level, grouped in 3 innovation dimensions: Company investments, Linkages & entrepreneurship; Intellectual assets. Outputs – cover the effects of firms’ innovation activities in 2 innovation dimensions: Innovators; Economic effects. Member states are classified into four performance groups based on their average innovation performance. Average performance is measured using a composite indicator building on data for 25 indicators going from a lowest possible performance of 0 to a maximum possible performance of 1. Inefficient exploitation of knowledge created elsewhere. The slow recovery from the crisis, the increasing competition from innovation in emerging economies, and the strength of US policies aimed at regaining a leading position are suggested as additional factors that undermine the European innovation performance. Currently the group of modest innovators includes Latvia, Bulgaria and Romania. The short profiles of these EU members are described below, taking into account the data provided by the 2015 Innobarometer (Innobarometer, 2015). Latvia has been the overall fastest growing country (3.4%) with a very strong performance increase between 2013 and 2014. Latvia’s performance level relative to the EU has jumped from 42% in 2013 to 49% in 2014 (in particular due to a very strong increase in Non-R&D innovation expenditures) and the country is close to becoming a moderate innovator. Latvia performs well below the EU average for most dimensions for the following UIS indexes: ‘Open, excellent and attractive research systems’ and ‘Linkages and entrepreneurship and Innovators ’. The relatively worst performing indicators are: ‘Public-private co-publications’, ‘Non-EU doctorate students’ and ‘License and patent revenues from abroad’. A large decline in performance is observed for ‘R&D expenditures in the business sector’ (-9.0%). Bulgaria’s relative strengths are in the following dimensions: ‘Human resources’ and ‘Intellectual assets’. The country has high shares of highly educated people and performs well in applying for the following indicators: Community trademarks (29%); R&D expenditures in the business sector (19%), Public-private co-publications (14%), and New doctorate graduates (10%). Strong declines in performance (growth rates refer to 2007-2014) are observed in Sales share of new innovations (-12%) and Venture capital investment (-28%). 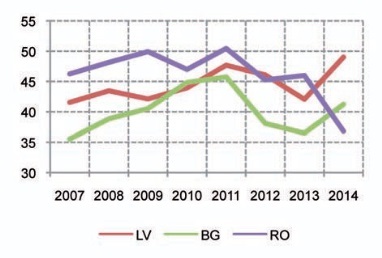 Over time, the relative performance of Romania has worsened from 46% in 2007 to 37% in 2014. The country performs similarly to the EU average for a number of indicators, in particular ‘New doctorate graduates’, ‘Exports in knowledge-intensive services’ and ‘Youth with upper secondary level education’. High growth is observed for the indicators Community designs (29%) and Community trademarks (22%). The strongest declines in performance are observed in Venture capital investments (-20%) and Sales share of new innovations (-21%). In conclusion the authors have to underline that the question about ensuring national authorities’ support for digital innovation remains an open question, despite the recent European Communication on Opening up Education. MOOCs are definitely a significant change agent in higher education. They mark a break-through of the powerful merger of two major long-term developments, towards open education and online education, respectively (Mulder, 2015). To date, some countries in Europe still do not have national regulations adequately responding to MOOCs. As in all areas where strategic institutional and national developments are required, policy makers and university associations and networks should facilitate dialogue and exchange among them. European universities have to strengthen their efforts in the development and provision of MOOCs as soon as possible; otherwise the market will be filled by initiatives from other institutions. The motivation to establish MOOCs, in Europe, cannot be the same as in the United States or in other regions of the world. There should be a European dimension to this as the socio-economic context, the cost of education and the role of the state to define the university strategy are completely different. The fact that MOOCs require a big investment, but at the same time do not guarantee immediate returns, is certainly another reason for caution, particularly in times of economic and financial crisis. It is not possible to expect a big progress in MOOCs if additional funding is not available and appropriate adjustments of the regulatory frameworks that support the activities of universities (staff and students) and their institutional partners are not ensured. Parr, C. 2013. “Mooc Completion Rates ‘below 7%”, The Times Higher Education, May 9. Hi Natasa Anonymous put an interesting post on the topic of “prior learning”. What do you think about it? Does him clarify your doubts?Best! Dear Sara, the comment was from me- Mariya Zheleva, I put it but without to enter with my profile. I provided link to material where the term “prior learning” is clarified.